Mom, the Intern: About Peeps. This is what I know about these bad boys. 1.) They contain a ridiculous amount of sugar. 2.) They are best when stale (it's true; try it). 3.) They can cause constipation. Do not eat when recovering from an episiotomy. By the way, I'm 23 today. Yippee! Twenty-three with two kids. I still can't wrap my brain around it. Also, congrats on turning 23! You've stayed alive for 23 years which is a lot more than some people could say. Yeah, even stale I just don't really like the peeps. And HAPPY BIRTHDAY! You are a young one. :) I will be 30 in October. I'm 24 and about to have my first, age aint nothin but a number!! I read you blog not only because I love your writing style, but because you are so wise. Will I be wise like you once I'm a mommy? 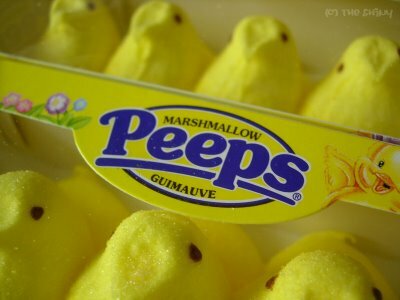 Stale peeps are the best. i've never heard the best when they are stale i'll have to try them!